I don’t know where I learned it or why it matters, but there is an unspoken rule in my house about taking “the last one”. It simply was not proper to take the last brownie, cookie, or pie sliver for yourself, unless of course, it was offered to you. My mom didn’t even allow leftovers to be eaten (unless specified), as they had already been assigned to the next evening’s meal. It’s not that food was rationed; there was always something to snack on, but there was something special about the last serving. My great uncle Oleg used to tell a favorite story of his about The Last Meatball. In a thick Russian accent, he would fondly recount the tale of a dinner many decades ago: when all the diners had been served and the food enjoyed, there remained just one meatball on the platter. They went around offering it to each other, but as is expected, all politely refused. Then suddenly the lights went out and there was a scream! When the lights came back on, several hands had been stabbed and the meatball was gone. He never admitted it, but I’ve always been sure that Uncle Oleg was the one that got the last meatball. My lovely fiancé Ameen, however, never learned about “the last one”. He wouldn’t blink an eye before eating the last Nanaimo bar, truffle, or cream puff. He even opened my Christmas chocolates to taste them before I even had a chance to stash them away for slow nibbling. I guesswhat’s mine is yours and what’s yours is mine right? But I love him dearly, and the smart guy that he is, he knows to listen when I ask him to obey “the last one” rule. It is no longer unspoken, and actually, I’ve taken to sticking a post-it note on certain items, which the following message is written: “Please, DON’T TOUCH! Love, Emily”. They say communication is the key to a successful relationship, and I’ve discovered that being polite, but frank is the best course of action. I made a batch of muffins the other day and after Ameen had consecutively scarfed three of them, I reminded him about “the last one”. He replied guiltily, “But they’re soooo good!” I told him to enjoy them, but to just save me one. When I woke up the next morning after he had already left for work, sure enough there was a pot of steaming coffee waiting and a lone muffin on the counter. I think he’ll fit right into our family. 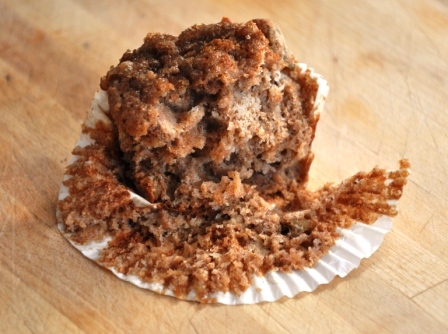 These tender muffins are made with 100% whole wheat flour, which contributes a subtle nutty flavor, deep brown color, and beneficial dietary fiber. The apples are sautéed in a little butter, brown sugar, and cinnamon to concentrate their flavors and allow excess water to evaporate before they are incorporated into the batter. 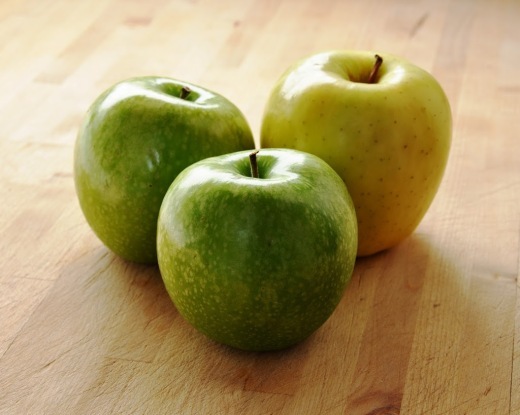 I used a mix of Granny Smith and Golden Delicious apples for a complex apple flavor and left the skins on for texture and additional fiber and nutrients. 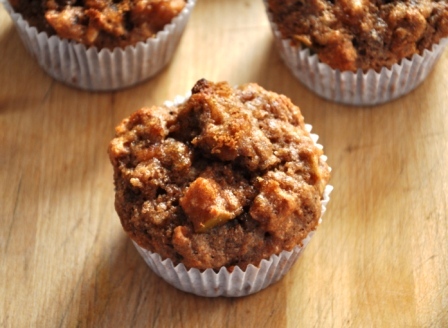 These muffins are fairly low in fat, as most of the moisture comes from applesauce, with a small amount of real butter to add flavor. They keep extraordinarily well, and I would even say they taste better on the second day, and make a great breakfast, snack or weeknight dessert. Just remember to save the last one for someone you love! Preheat the oven to 350°. Line a nonstick, 12-cup muffin tin with paper cups or spray with nonstick cooking spray and set aside. Core and chop the unpeeled apples into ¼ inch pieces. 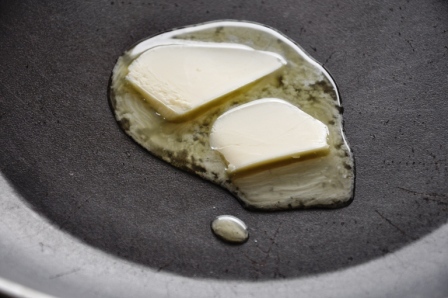 Melt 2 tablespoons of the butter in a large skillet over medium heat. 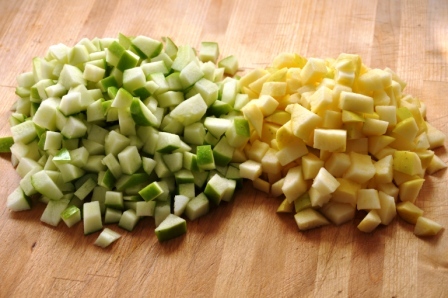 When melted, add the chopped apples, ¼ cup brown sugar, and cinnamon. Cook the apples stirring frequently, for about 20 minutes, until they are tender but not mushy. Leave to cool in the pan. 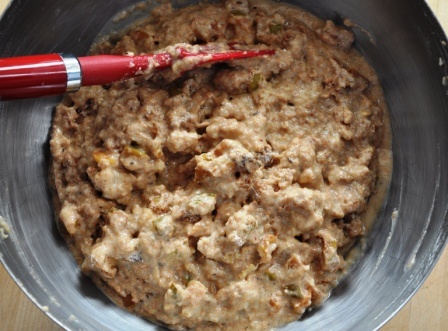 While the apples are cooking, whisk together the dry ingredients until thoroughly combined. Add the cooked apples to the dry ingredients, and fold together with a spatula until all the apple pieces are evenly coated with the dry ingredients. In a separate bowl, whisk the melted butter into the eggs until thoroughly combined. Add the remaining wet ingredients and mix thoroughly. 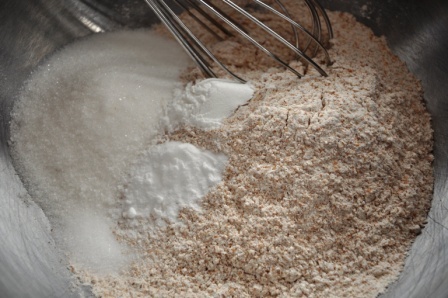 Pour the wet ingredients onto the dry ingredients and fold together with a spatula until just combined. Do not over mix the batter or the muffins will be tough and will rise unevenly. 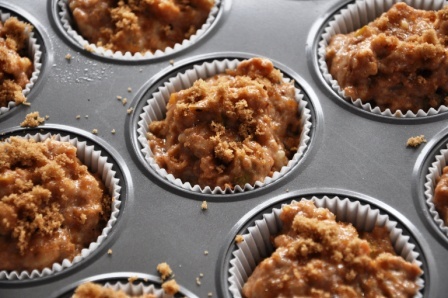 Portion the batter into the prepared muffin cups evenly, filling each one up to the top. Sprinkle the remaining 2 tablespoons of brown sugar evenly over the muffin tops. Bake for about 20 minutes, checking the muffins after 15 minutes. They are done when they are golden brown, no longer look doughy, and a skewer or toothpick inserted in the middle of a muffin comes out clean. Remove the muffins to a wire rack and cool at least 30 minutes. Can be stored in an airtight container for up to 4 days. I will try these soon! I don’t really eat butter but maybe I’ll substitute macadamia nut oil. Cathy, please do and let me know how they turn out! I wish I had made some yesterday….I need one right now! I’m making these muffins this weekend!